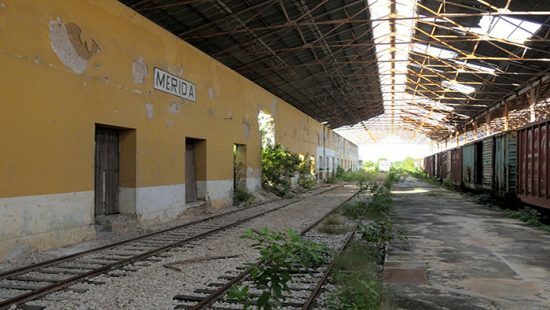 On Saturday March 11, the public is invited to tour the La Plancha railway station and staging yards in central Merida where activists hope to create a large Central Park-style green space. The tour, which will leave from the railway station at 9 a.m., will last about three hours. The departure point is located at Calle 55 and 48. A master plan has been developed for Gran Parque la Plancha, which intends to convert abandoned railroad yards between Calles 55 and 43 and Calles 48 and 46 into a much-needed park that would reclaim a no-man’s-land and eyesore in Merida’s urban core. Promoters of the massive $100 million USD, 24-hectares (52 acres) project, which has been on the drawing board since 2014, are courting support from local, state and national politicians. Where: The train station at Calle 55 and 48. Centro. Parking available. Cost: $200 pesos in advance, $250 pesos at the event. Tickets available at: Hennessy’s, Robert Abuda Salon, El Bull Pen. The preliminary plans for La Plancha envision a large green space that will also utilize the abandoned railway warehouses and train cars for retail shops, classrooms and restaurants. Cristina de León, project coordinator for Parques de Mexico, said the group is actively recruiting volunteers from both expat and local communities to lend time and expertise to the La Plancha project. Interested volunteers should contact Parques de Mexico at info@parquesdemexico.org or call 999 944 4060.